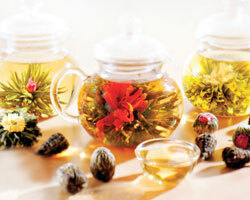 Hand-crafted premium white, green and black teas are included in the Flowering Tea line. While most teas are picked as the top two leaves and bud of the tea plant, white teas are picked in the early spring before the buds open and are exclusively the top leaf and bud. White tea is the least processed form of tea undergoing almost no transformation. Leaves are simply picked, air-dried, and rarely shaped like other teas. Tea leaves are heated to stop the oxidation (exposure to oxygen) process therefore slightly oxidized. White tea leaves are easily identified by their silky, white downy hairs. Flavors range from sweet and delicate, to savory, velvety, smooth, and orchid-like. Designed in the shape of a small lychee fruit, this white tea unfurls into a star shape. Its light, pale infusion has a mellow white tea flavor. Lavender Dream awakes as rare white tea buds unfurl to reveal majestic red hibiscus petals. Crisp aromatic lavender flowers are released into the crimson hue. This tranquil romance of sublime white tea touched by tangy and sweet soothes as it enriches. All tea leaves are picked green. When the leaves are immediately steamed or pan-fried, the heat stops the oxidation process (exposure to oxygen) and keeps the tea leaves green. Green tea leaves are also flattened or curled. Green teas usually have a grassy, vegetal, nutty and savory taste. Green tea is often scented with jasmine flowers for a floral taste. Rich jade green tea leaves are wrapped around a rod to give them their distinctive shape. As the rings unravel slender leaves, the delicate yet robust flavor compliments the elegant jade liquor and slight toasty aroma. White willow bark, yarrow, buckthorn bark, angelica root, black cohosh, valerian, rue and skull cap to help ease the discomfort of arthritis. A stimulating mix of gota kola, ginseng, peppermint, damiana, rosemary, eucalyptus & black teas base. A dreamy formulation of catnip, mugwort, oakmoss, lavender, linden, chamomile & mistletoe. To alleviate headache pain. Soothing mix of white willow bark, basil, lemon balm, cayenne, chamomile, ginger, marjoram, parsley & peppermint. Aids in lowering blood pressure. Angelica root, mistletoe, sassafras, marshmallow root, & licorice help soothe hypertension. Builds body immunity. Specially formulated to strengthen immunity with wormwood, sage speedwell, licorice, ginseng, heal all, pau d'arco and echinacea. Aphrodisiac. Promotes peaceful, loving feelings with lavender, jasmine, lady's mantle, peach tree leaves, damiana, myrtle and clove. Men's ritual tea. This magical blend contains jasmine, cassia bark, mistletoe, rue, star anise, and black tea. Excellent tasting as well! To aid memory. Stimulating mixture of ginseng, gotu kola, rosemary, & rose hips. Nerve relaxant. Calming blend of linden, lavender, chamomile, clove, rosemary and valerian. A special tea formulated to ease your pain. St. John's wort, white willow bark, cayenne, arnica, jasmine and clove. Brings abundance into your life with help of moneywort, sage, parsley, meadowsweet, mistletoe, basil, rose hips, clover, & black tea base combined to attract the forces of abundance. Activates psychic awareness. A stimulating formulation of rosemary, clove, eyebright, mistletoe, oakmoss, elecampane, and rue. Stop colds and respiratory ailments. Herbs to strengthen the respiratory system includes slippery elm, elecampane, comfrey, hyssop, vervain, licorice, wild cherry bark, orange chip & coltsfoot. To calm and heal throat. A soothing mix of wild cherry, licorice, slippery elm, fennel seed, sweet orange, & cassia chips. Rebuilds body strength & immunity. A special restorative blend of sage, thyme, hyssop, spearmint, wormwood, marjoram, and ginseng. Mullein, corn silk, peppermint, calendula and comfrey are included in this special formulation of digestive herbs. Rebuilds vitamin C naturally. Rich in vitamin C: lemon balm, rose hips, cinnamon, orange, tangerine, southernwood. Speed metabolism & retard appetite with this blend of sarsaparilla, licorice, fennel seed, cornsilk, horehound, bladderwalk, hawthorn berries, echinacea, chickweed, burdock root, parsley, kelp, black walnut, kola nuts, uerba mate, cleavers, plantain, spearmint & oakstraw. For PMS & menopause. This refreshing, restorative tonic is specially formulated for women. Lady's mantle, motherwort, jasmine, hyssop, arnica, red raspberry.